Via Truveo and Roosevelt Island 360, here is the NY 1 story on the Roosevelt Island Bridge getting stuck in the Up position for more than six hours on Friday night. Received this email message from reader last night advising of problems on the Roosevelt Island Bridge and inquiring if anyone knew what was happening. ...I just wanted to check in and see if you knew what was going on with the bridge tonight? 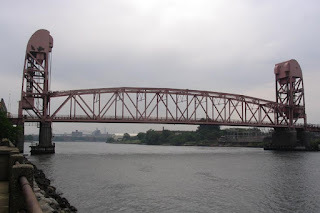 I arrived home very late from Manhattan on the Tram and noticed that the "Red Bridge to Queens" had jammed up a number of motorists on R.I. This was at 10:30pm and it's now about 1:07p.m and it still looks like nothing has moved. We live in Manhattan Park with a view to the east. Anywho, I hope these poor people waiting for the bridge get home soon. At the Farmer's Market this morning I learned from a Channel 9 reporter who was covering the story that that the Bridge was stuck in the up position for many hours last night. Drivers trying to cross the Roosevelt Island Bridge overnight sat for six hours Friday because the bridge was stuck in the up position. The span got stuck in an up position at around 11 p.m., leaving a gap in the roadway that kept traffic from crossing. The bridge and its approach are being completely overhauled, and according to the city's Department of Transportation, the company in charge of the reconstruction tried to fix the jam itself. DOT says they did not get a call until two hours later. DOT crews were able to fix the problem and the bridge reopened shortly after 5 a.m. Saturday. Nothing as of yet on the RIOC web site. Roosevelt Island Bridge Image is from Bridge and Tunnel Club. 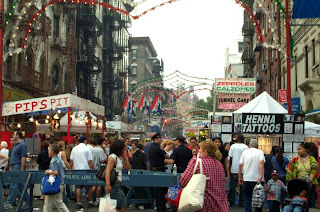 They are a great source for information on New York City neighborhoods. Apparently the Zog soccer players are having problems with the Roosevelt Island playing field conditions. We have received some feedback from a few of you stating concerns about the field conditions at Roosevelt Island. 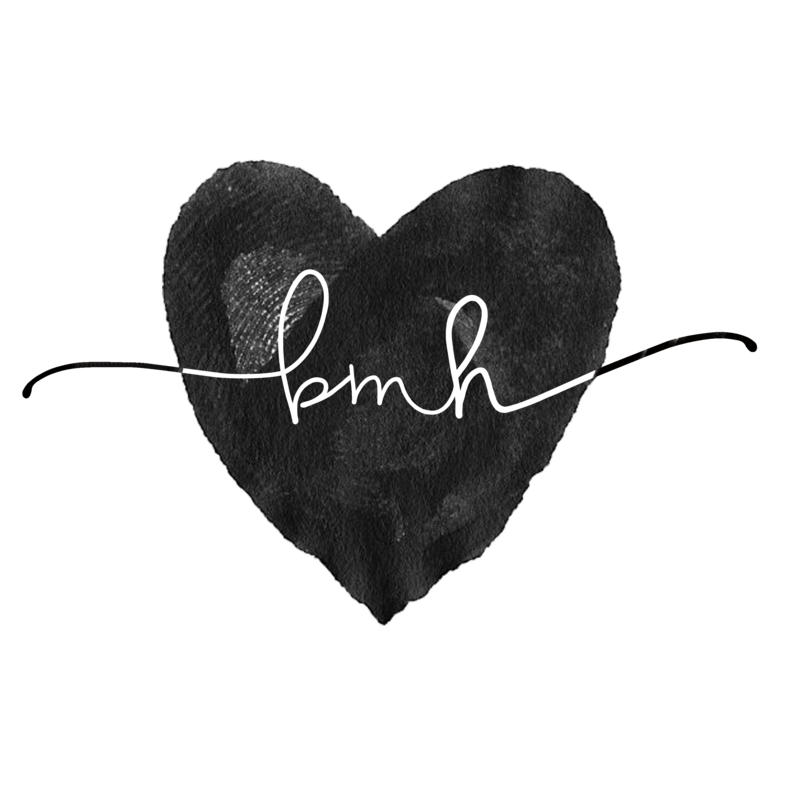 So we wanted to take a moment to address those concerns and let you know what we have been doing to rectify the situation. Zog Sports has been speaking with our main contact on Roosevelt Island for the past two months to try to improve the field conditions. Unfortunately, our contact is relatively junior and did not have the clout to get the engineering staff to help us improve the situation. So we made some polite noise and secured a meeting with the VP of Operations and Chief Engineer for all of Roosevelt Island. We will be meeting with them, as well as the field maintenance staff, on Friday morning, September 21, to determine what we can do in the short term to improve field conditions. 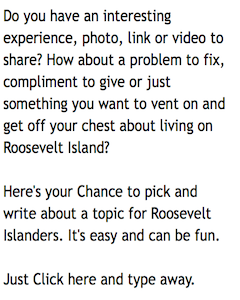 I think Roosevelt Island residents would be interested in the results of that meeting as well. 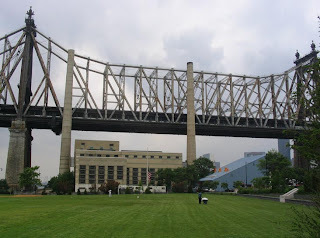 The image of the ball field by Queensborough Bridge comes from Bridge and Tunnel club tour of Roosevelt Island. The weekend is approaching so it is time for some music. Since Roosevelt Island is surrounded by water I thought it appropriate to again hear the music of one of my favorite live performance bands, Great Big Sea, and see images of another waterfront community, Newfoundland in Canada. I would like to make this a regular weekend feature so if anybody has a waterfront related video they would like to share please send me a link. Last night I attended the fifth anniversary party for the New York Water Taxi ferry service at NY Water Taxi Beach in Long Island City. Great time was had by all with terrific food, drink, company and views. The Water Taxi Beach will be open on weekends through Columbus Day, October 8. If you have not been there yet, go , you will have a great time. Congratulations to Tom Fox and the whole NY Water Taxi crew for bringing this great service to the waterfront of New York City. Please bring your ferry service to Roosevelt Island. Here is the You Tube video link. Free Wi-Fi for Roosevelt Island Public Spaces - When? WiFi, short for wireless fidelity, works life this:A wireless Internet router sends a signal that's picked up by computer modems, personal digitial assistants and Internet-equipped cell phones within about 250 feet. The wireless signal is transmitted over the airwaves on the 2.4-gigahertz band, the same unlicensed spectrum microwaves travel on — and once dominated by the cries of infants on baby monitors. WiMax and a satellite connection are bringing broadband Internet access to a remote Vietnamese village, part of a collaboration between the public and private sector to narrow the digital divide in rural Vietnam. Ta Van, a small village located in Vietnam's northern Lao Cai province, has a wireless network that uses Wi-Fi and WiMax, a wide-area networking technology that offers high bandwidth. This wireless network is connected to the Internet over a link to Shin Corp.'s IPSTAR satellite that offers 2M bits per second (bps) of bandwidth on the downlink connection and a 512K bps uplink. The company providing Internet services at the Octagon Apartments hopes to provide similar services covering all of Roosevelt Island, using both "wi-fi" (wireless coverage via radio waves) and the existing power lines in residential buildings. For other areas of Roosevelt Island, Telkonet President Frank Matarazzo says his company is contacting building owners, tenant associations, and others in an effort to secure contracts to provide the services. Where it is not provided as part of a blanket contract, NuVisions service can be purchased on an hourly basis. Current pricing is $9.95, for example, for a measured ten hours that can be used in bits and pieces over an extended period of time, or month-by-month for unlimited access at $29.95. Subscribers on the Island will be able to use NuVisions service anywhere it’s offered, not just on the Island. Has there been any progress on bringing wi-fi, particularly free wi-fi to Roosevelt Island? Roosevelt Island at night video with Coldplay via our Italian friend. The owners of the soon to be opened (early November?) Nonno's Focacceria have already started serving food to restaurant starved Roosevelt Island by operating an outdoor trailer kiosk between Southtown Buildings 3 & 4. The kiosk is opened in the mornings and afternoon. The menu includes hot dogs, sweet and hot Italian sausages and knishes. When I was there, I waited behind a line of Riverwalk construction workers who gave the food a thumbs up! I had a knish with onions and peppers. Yum. It appears that the operator was warehousing the vacant apartments in anticipation of a windfall from their sale as condominiums. Nevertheless, the report said, an agency inspector “termed the complex’s inflated vacancy rate ‘satisfactory.’ ” The sale fell through in March 2006. The farmer's market on Saturday on RI is as pathetic as one would expect of a Roosevelt Island institution. With the exception of the very few items market "homegrown" everything else comes from the same Carlifornia factory farms that supply Gristede's. Okay -- maybe they make a bit more of an effort to get fresher vegetables or fruit, but it still is not a real farmer's market. Even the bread -- which, theoretically is high quality -- comes wrapped in plastic to ensure that it loses its crustiness. Try explaining to the sellers (not connected with the bakers, btw) that bread should be wrapped in paper, not plastic and listen to the response. 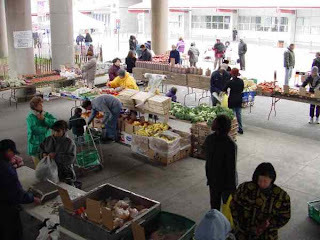 While I agree that the farmers market is not a real farmers market or even that great it is far better than what Gristedes has to offer, quality and price-wise. I have purchased fruits and vegetable several times at the Farmer's Market and believe it to be better than the Gristedes on price and quality but not as good as either Fresh Direct or Food Emporium. 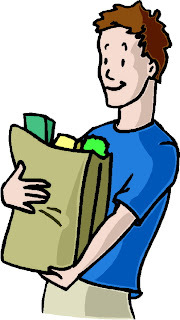 However, shopping at the Farmer's Market does provide a nice warm and fuzzy feeling because of the outdoor setting, particularly on a sunny morning, and you are more likely to strike up a pleasant conversation with fellow residents or friends than at Gristedes. 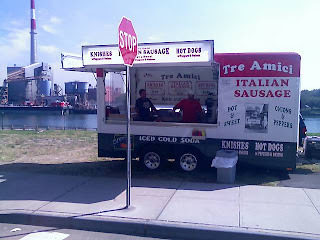 A big thank you to one of the readers who sent the following link to a Main Street Wire article on the Gristedes non-compete clause which came close to moving the Farmer's market from the Motorgate ramp area as well this link here. 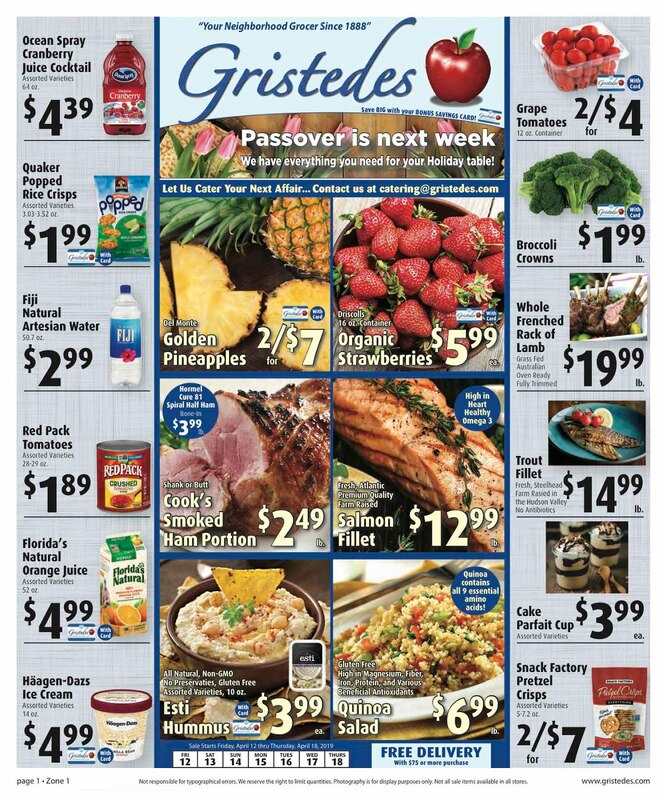 The reader also sent a link (PDF file) to Main Street Wire article providing background on the expansion of the Gristedes store in 1998 and how the impact it had on the smaller Island merchants. Roosevelt Island Subway Up Escalator Now Working!!! Just got off the F train preparing for the long ascent up the top staircase to the street when I was pleasantly surprised to find the Up escalator was now working. Although I am glad that the escalator is in service, at least for the moment, the long climb up the staircase served as an exercise substitute for the StairMaster. Now it is back to the dreaded machine. Here is the You Tube Uni-Geezer link. Don't try this when the escalator goes out again. Continuing the Timeline of Roosevelt Island history compiled by the Main Street Wire, this week's history post focuses on the always topical and fun 18th Century. Roosevelt (Blackwell's) Island was put up for sale in 1782 and 1794 being described as a "pleasant, agreeable situation island" and "remarkable for the number of fish and fowl" caught. Property did not sell. Perhaps a Post Revolutionary War credit crunch? The property finally sold in 1828 when New York City bought the Island for "$32,500 as a location for a charitable and correction institutions". 1717 Approximate date of death of Robert Blackwell. His son, Jacob, survives him and marries Mary Hallet. They later have a son, also named Jacob. 1776 Jacob Blackwell is loyal to the American Revolution, so Blackwell's Island is confiscated by the British during their occupation of New York. 1780 Jacob Blackwell dies on October 24. His will leaves "my Island known by the name of Blackwell's Island" to his sons, Jacob and James. 1782 A newspaper notes that "Sir Guy Carlton has visited all the prison ships at New York, minutely examined into the situation of the prisoners and expressed his intentsions of having them better provided for; that they were to be landed on Blackwell's Island in New York harbor during the hot season in the day time." For Sale, that pleasant, agreeable situation Island, known by the name of Blackwell's Island, on the East River, about four miles from this City. It is without exception one of the most healthy situations in this state. It is remarkable for the number of fish and fowl that is caught here in the different seasons. There is on the premises two small dwelling houses, a barn, bake and fowl house, cyder mill, a large orchard containing 450 of the best grafted fruit trees, such as Newton & Golder pippins, spitsinburghs, peirmans, bow apples, pears, peaches, plums, cheerries, etc. There are a number of the best stone quarries ready cleared to begin breaking immediately, etc. 1794 Island again advertised for sale. Again, no takers. 1796 Blackwell house is built. Today, it still stands as the oldest structure on the island. Here is the prior 16th Century Roosevelt Island Timeline post. Spent the weekend away from Roosevelt Island in Boston to attend Sunday's Yankee/Red Sox game at Fenway Park. Fenway is a beautiful place to see a baseball game and I had a great time - made even better by the exciting game coming down to a classic Mariano/Big Papi bases loaded, 2-out, bottom-of-the-ninth confrontation, won by the greatest closer in baseball history, and an eighth inning three run homer by Derek Jeter, respectfully referred to as Captain Intangible or just CI by knowledgeable Red Sox fans. During this past summer, I noticed several Roosevelt Islanders wearing Red Sox T-Shirts and Hats. For those of you who root for the Red Sox I recommend you take a look at a great Red Sox fan site - The Sons of Sam Horn. I met several of the Sons and they treated this Yankee fan with respect and friendship. 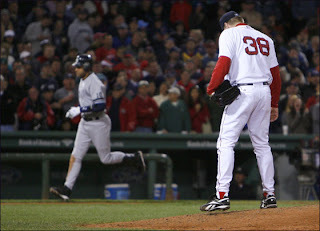 If you love your Sox, you will get a big kick out of this site. Will the increased competition caused by the arrival of Duane Reade improve service and pricing at the local Roosevelt Island Gristedes? Residents now have greater choices for their grocery shopping on Roosevelt Island being able to choose from among the new Duane Reade, Gristedes, Deli on Main Street, off-Island retailers such as the Food Emporium on First Avenue, Trade Fair on 36th Avenue, Costco on Vernon B'lvd as well as online grocery stores such as Fresh Direct, Bread'nBie and Gristedes online. the number of Gristedes stores has dropped from 78 a decade ago to 39 today (35 stores are in Manhattan), as a once familiar New York City name continues to recede. Most recently, the Gristedes at Central Park West and 62nd Street shut. ...“The problem in New York City is you’re going to be left with no supermarkets” because of the rise in basic costs, like rent, he said. When you Gotta Go - Where do you Go on Roosevelt Island? Good Day: I was visiting Roosevelt Island yesterday. ..."My Bathroom Is A Private Kind Of Place.' 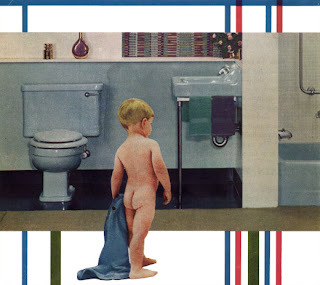 It"s from the "The Bathrooms Are Coming,' an industrial-show musical produced for the American Standard Company to extol the glories of their wonderful plumbing fixtures. Almost every day, well no actually almost every other month, more and more signs of modern retail amenities are appearing on Roosevelt Island. The manager of the recently opened Duane Reade informed me that a Chase ATM machine will be installed inside the store during the first two weeks of October. Existing Chase customers will not be charged for using the ATM. Also, I noticed that there is a coin change counting machine where one can bring in loose change and exchange it for cash. This is a very convenient feature to use for emptying out your penny, nickel, dime and quarter jars, however there is an approximately 9% service charge for using the machine. If you want to save the service fee charge, Commerce Bank has a no fee machine. A tour slated for 16 cities attracted thousands in its first two stops over the weekend, in Columbia, S.C., and Raleigh, N.C., where people lined up to sign a steel beam to be part of the memorial. Fund-raising has topped $300 million, with a goal of $350 million for construction by September 2009. 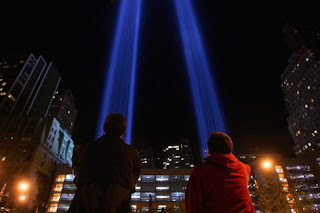 To my mind the Tribute in Light continues to be the most moving and appropriate Memorial to that day. There is a poll on this topic in the column on the right below the Statement of Purpose. Image is from USA Today. The hurricane deductibles are now reaching New England and the New York metropolitan region — areas that can be affected by Atlantic hurricanes. According to the Insurance Information Institute (www.iii.org), 18 states and the District of Columbia have hurricane deductibles, including Connecticut, New Jersey and New York. There are two kinds of wind damage deductibles: those that apply specifically to named hurricanes and those that apply to windstorms or wind and hail damage. Percentages range from 1 to 5 percent of a home’s insured value, but in some coastal areas the deductible can be as high as 25 percent. “The rationale behind the coastal deductibles is that we’re seeing an explosion of growth along hurricane-exposed coastlines,” Mr. Hartwig said, noting that 53 percent of the population now lives within 50 miles of a coastline. Here is some additional information from United Policy Holders and and more from Insurance Information Institute. 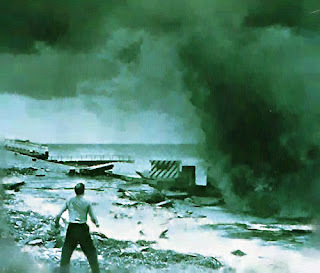 Image is from the National Oceanic and Atmospheric Administation (NOAA) History web site describing 1943 "Surprise" Houston - Galveston Texas hurricane that killed more than 275 people. 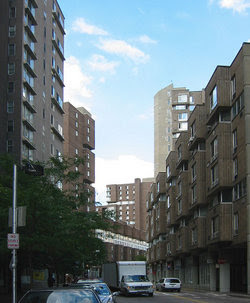 This Friday, September 21, 2007, at 2:30 pm on the Manhattan Neighborhood Network [Channel 34 Time Warner/Channel 82 RCN], Community Board 8 will rebroadcast "Hurricane Preparedness Comes to Roosevelt Island". According to Elizabeth McKee of Community Board 8 the broadcast is a videotape of the July 20, 2006 event that took place at the Church of Good Shepherd which was sponsored by CB8. The July 20, meeting was referenced here. 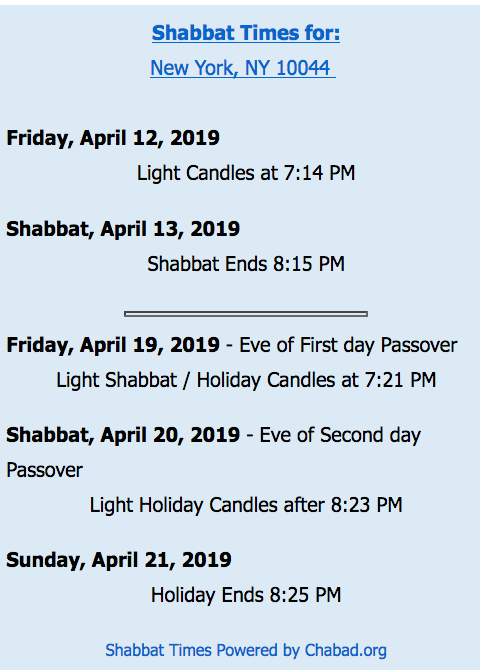 It would be a great community service for Community Board 8 to upload the video to the web, perhaps a series of 5 minute You Tube clips, for those who are not able to watch on Friday. Good job by Roosevelt Island 360 in getting more information on topic. A reader sends in the following question regarding parking on Roosevelt Island. I have a friend who is moving to Roosevelt Island and I was wondering, where do visitors park? Like if I had to come over for like 15 mins. at 10PM, is there somewhere I can park my car? Is there even street parking? There is an indoor parking garage called Motorgate where most cars are parked. Here is information regarding the Motoragate Garage courtesy of RIOC. The Octagon building has a separate paid parking facility for their tenants but I'm not sure what is available for their guests.The other buildings at Riverwalk, Manhattan Park and the Main Street buildings do not have their own parking facilities but rely on the extremely limited street space in front of the respective building. There is very little sidewalk parking on Roosevelt Island and a 40 minute time limit for a space on Main Street if it can be found. I would recommend calling RIOC directly to find out what they say are the parking rules. RIOC's phone # is 212-832-4582. A similar question was posed to RIOC's Dear Cathy feature. Here is that exchange. Lots of good info, but no mention of street parking rules. eh? I gather no one on RIOC staff gets parking tickets so you don't care. Gee, I wish my guests were immune to Public Safety's tickets!. (I almost never walk away from my car, rare can I find a real space, though I load and unload on Main Street almost every time I drive off the Island or return). I need to give a contractor instructions and Motorgate is expensive for a 1 hour visit. I wanted to check the rules for north Main Street between River Road and Motorgate... I vaguely remember street parking is permitted there for 2 hours? (not just the 40? 20? minutes permitted in front of the WIRE buildings where I live. One of the benefits of "Ask Cathy" is that we learn what kind of information residents are looking for at our website. Parking rules will be posted. Thank you for the suggestion. Actually, our staff have received parking tickets! Many residents have complained about people parking illegally on Main Street and Public Safety has been diligent about enforcing the parking rules. There is metered parking (up to 40 minutes) all along Main Street. There is metered long-term parking (up to 6 hours) at River Road and the northern end of Main Street (near Gristedes to the Fire house). As you point out, Motorgate is also available for short-term and long-term parking. UPDATE - 12/11/08 - Here is more information on getting to and parking on Roosevelt Island. A Transportation Alternative to the Roosevelt Island Tram and Subway? 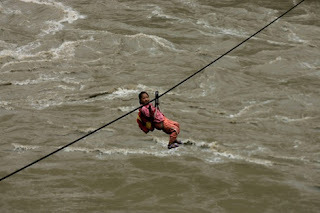 Via Andrew Sullivans's Face of the Day feature, this picture shows a third grade student from China using a zip line to cross the Nujiang River to get to school (Photo by China Pictures/Getty Pictures). In the event that the Tram is out of service for a period of time, perhaps the zip line can be used for transportation off the island if this method from an earlier post can not be used. This picture also tells alot about the desire for education by these children.